Another note which cost me a bit when I was in Manila was this 500 Peso note. I don't have my catalogue with me to say what year this was but I remembered that this one was issued a few years after the end of the Second World War. This was an unusual series called the 'English' series as all the writings on the notes are in English unlike today's which is purely in Tagalog. This particular fine note cost me 3,000 Peso which is around B$100.00 which actually is quite expensive. I would have to wait for a Filipino to comment on the photograph and features of the currency note. When I was in Manila recently, I came across a shop in San Juan selling Philippines currency notes. At first I just wanted to have a look but when the lady started taking out all her notes, I could not help but just had to buy everything she had on Philippines. Over the next few weeks, I will highlight those that I bought. One of the more expensive note which I bought was this 1921 note. The original price for this note was 17,000 Peso which is far from what I am willing to pay. But after negotiation plus the fact that my total purchase have already exceeded four figures, I decided to purchase this one for around 10,000 Peso which is roughly around B$300 which is again much more than I should spending on this. But it is 1921 and it is one of the more rare notes so I guess I should not regret this. I managed to get all the modern currencies as well as the various bank notes issued during the war by the various regions. Those were interesting. I am still following up a few of the Philippines Currency notes which I do not have in my posession. 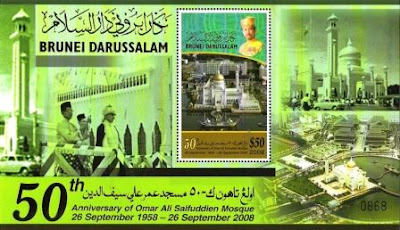 Last month, 26th September 2008, was the 50th anniversary of Masjid Sultan Omar Ali Saifuddien. The Postal Services issued a set of new stamps to commemorate the event plus two miniature sheets. 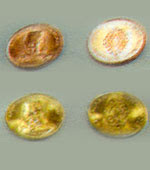 The first miniature sheet is shown above which is the high value miniature sheet with a $50 stamp. This $50 stamp is not the first $50 stamp for Brunei. The first $50 stamp was issued in 1996 for His Majesty's 50th Birthday. In fact five $50 stamps were produced especially for that and the miniature sheet sold for $250 (it is about $800 on the market now). A $60 stamp was issued for His Majesty's 60th Birthday and a $40 stamp was issued for His Majesty's 40th Coronation earlier this year. 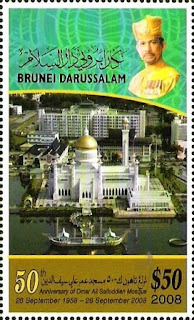 This high value stamp is certainly an interesting marketing strategy for Brunei's Postal Services as not that many people will be using this $50 stamp. I would say a used one would probably cost more than an unused one. Back in the 1970s, most people did not know that the mosque was also a school. In those days, Madrasah, the building next to the mosque was the only school that provided sekolah ugama in the morning in the whole of Brunei, I think. Most of us who attended the Brunei Preparatory Schools would be going to school in the afternoon. So the only way to go get sekolah ugama would be going to madrasah. Madrasah classes were overflowing. I remembered there were about 50+ of us in each class. The classes were not even partitioned properly except with standing wooden partition. You can hear the classes next to you. We were like that for a few months before they started using the balconies overlooking the main prayer hall at SOAS Mosque. Every day we would be dragging up a standing blackboard up to the balcony. The balcony is not very visible from the main prayer hall but every Thursday I would remember looking down at the workers laying the carpets for the next day Friday prayers. I think in those days, the carpets were not permanently placed on the floors. So on the balcony, there would be two or three classes, one on both ends and one in the middle. This went out for a few months before we got moved to the classes at BPS Bandar at today's SOAS College padang. That's another interesting story in itself. I remembered SOAS Mosque. I am probably one of a few people in Brunei who can say I studied there. The Brunei Currency and Monetary Board (BCMB) issued new one-cent coins yesterday. The new coins will be in circulation alongside present one-cent coins and both would remain as legal tender in Brunei Darussalam and countries that accept them. The announcement was made by Sainin bin Hari Mohammad, manager of the Brunei Currency and Monetary Board (BCMB) currency operation, who spoke on behalf of the Chief Executive Officer during a press conference at the BCMB building yesterday. The difference between the new and present one-cent coin is that new one-cent coin is made from a composition of copper and zinc metals and is yellowish in color, while the present one-cent coin is made up of only copper metal and is brownish in color. However, the new one-cent coin still retains some of the present one-cent coin features. The weight of the new and present coin is around 1.780 to 1.8010 grams per unit and has a diameter of 17.610 to 17.660 millimeters. According to the BCMB official, the selection of copper and zinc metals in producing the new coins was to save production cost, thus, justifying the face value of the coin.